Check out the front page of the Philippine Daily Inquirer. The Pio Chapel and Bagac project issue is discussed. This is an example of how a community and an entire province can unite to save its architectural heritage. Indeed, this is good news for Pampanga which celebrates its 435th anniversary today. PORAC, PAMPANGA -- Sitting on a bamboo bench by the roadside, 86-year-old Felicidad Lising let out an expression of outrage her neighbors in the village of Pio here do not usually hear from the mild-mannered grandmother. “Ay Dios ko! E ustu ita (Oh my God! That’s a wrong thing to do),” Lising said, casting her droopy eyes on the village’s 145-year-old Catholic chapel. The second part of the special report has been published. 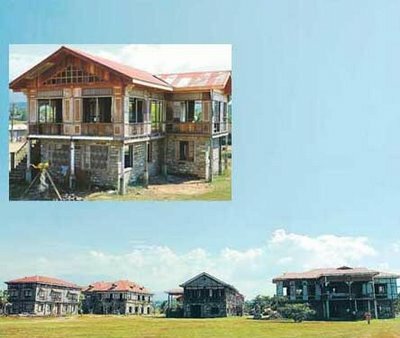 Check out ‘Old town’ for posterity, says developer in the Philippine Daily Inquirer. I would agree with Acuzar on the point that he is not breaking the law since the structures are not NHI-declared. That simply means that the NHI is slow and is not doing its job since Acuzar himself admitted that two of the structures he is currently transferring are historically important! Which is why he wants to keep quiet about it first so that it doesn't raise any howls until the transfer is completed. I also agree with his chief architect Joel Rico that most of the heritage laws in the Philippines only ensure protection, not funding. Which is why Congress better enact the heritage bills fast! But sad to say, Rico is not a trained restoration architect. Even if Acuzar says houses are transferred "as is," visitors to his project have commented that the houses were not assembled properly. The main issue here is not simply the transfer but the fact that Acuzar is actively shopping for old houses, trying to woo the owners into selling their properties to him! How ironic that he mentions Scandanavia where "culture is preserved in structures." If he was indeed to follow the example he cited, structures should remain where they are, preserved together with the environment they were built in! As I always say, the best way to preserve a structure is to educate the local community about its importance to the history and heritage of the place, as well as its economic potential if preserved properly. I would have more respect for Acuzar if instead of uprooting all these structures from the communities where they form an inherent part of the historical and cultural fabric; since he has all the money to spend anyway, he should instead build replicas! In that manner, communities get to keep their heritage. That is a very interesting article Ivan. Imagine a wholesale transport of a heritage structure which is a chapel where the community is deeply invested in. I'm surprised the the Gils have not donated the structure and the land on which it was built to the town of Pio. That would have saved them real property tax. Moreover, the use of the structure and the land has given it a public nature. As for the moratorium on the Acuzar project, that seems to be too onerous. Perhaps he can continue to build his dream Heritage pueblo/town for as long as he buys the materials from dilapidated houses that are being torn down and antique and "junk" shops. The suggested debates, discussion points on historical significance of the structures, their actual or future functions to the residents and the communities, consultation requirements, protocols, local heritage plans and the local government’s position on the issue, might take such a long time and pose undue restraint on the person who might also share the same goals as restoration and preservation of old structures. But the problem is he is shopping for the best examples of old houses and is said to use coffee table books featuring old houses as shopping catalogues. Bulacan is also up in arms after word reached them he bought the Mercado House in Bustos which was ironically featured in the heritage calendar of Shell. He's also after the Constantino House in Balagtas, another treasure in Bulacan! Plus he's already transferring the historic Enriquez Mansion from Hidalgo Street in Quiapo. Check out my earlier blog entries on Porac and Bustos. Another main issue is the location. Note that the location would eventually lead to the damage to all the houses he transferred. Aside from the fact that the architect he hired is not trained in restoration resulting in the wrong assembling of houses, the beach location exposes the houses to the elements. The salt encrustation and strong winds would lead to the disintegration of the adobe walls which have not been protected by plaster, again because the architect is not trained in restoration. Plus just one tsunami and they are all gone. Undue restraint? Heritage should not be transferred en masse in the first place. I think he should be stopped. Instead we should educate communities how important these structures are to the historical fabric of their place, that they are inherent parts of their history. If we allow this thing to continue unregulated, what would stop another Acuzar from tearing down heritage towns and tranferring them to their private properties for their personal enjoyment rather than stay in the communities they were built in to serve as catalysts for pride of place? Since he has so much money anyway, why not just built replicas since that would come out cheaper and easier. Plus communities get to keep their heritage. Oh wow. There is actually an imminent danger there of the destruction of our heritage structures in their original locales. How can you then impose a moratorium on this? Is there an agency that has 'personality' or interest to ask for a permanent injunction on the wholesale purchase of these historical structures only to be uprooted from their sites? Those heritage bills should be fast-tracked so that there is a basis for the injunction. Yes, the bills have to be fast-tracked. But the community itself can help impose a "moratorium" because public outrage by communities which value their heritage scares these would-be buyers away, more so if they have bolos ready to chase them out. But what if those houses are privately owned and used? What can the community do to prevent its sale? They may be accused of grave threats and unjust vexation if they try to get in the way of the transaction. Well, that was the case of the chapel since it is community property. The bolo thing was just to add some humor. Hehe! On the old houses, local governments have a big say. Let him try doing that in San Fernando, Pampanga for example which has already declared all its old structures locally. Even the house owners might bark back at him if he tried. My point is, if we educate a community, like what we did in San Fernando, and what we're trying to do in the entire province of Pampanga, they become a potent force in averting the loss of heritage in their place. That is so true. Carry on the mission. I am glad that there are avid guardians and protectors of our heritage like you doing these daunting tasks and advocacy. Ivan, I really admire you for your tireless efforts in trying to preserve what little we have left in on our heritage particularly old churches and schools. The City of San Fernando was a success by passing a heritage bill which is now being copied by others, but how about the other towns without the financial resources? Does the government has a consistent and sustained policy to preserve this old structures? Who pays for all of this? Hi there portludlow. You don't need funds to pass a heritage ordinance. The most you'd spend for is maybe food for the meetings and public hearings, and small markers for each structure. I remember spending less than P2,000 for each 8x10 inch marker I installed in the San Fernando Heritage District so that each structure has an available history the public could read. We started the campaign by doing a cultural map of the city. When I joined the city government as a volunteer in 2001, the heritage structures were ordinary old houses to the community. We then came up with a new tourist map featuring the heritage district and the point-of-view of the city changed overnight. From mere old houses, they now regarded them as heritage structures. The restoration comes in later when the community itself realizes the need for it. In San Fernando, when civic leaders realized the importance of heritage, we saw hundreds of thousands being raised in a matter of days. But while you are still in the education stage, what's important is to keep them intact so that when the community understands their value, the structures are still there to restore. I don't like the idea of a heritage structures being relocated. There is something very '1984' about taking something that's been in a community for 50, 100 years and moving it without good cause. Original is best when it comes to restoring a heritage structure. I think that goes double for original location unless there is an urgent reason for a move. Heritage structures almost have a life of their own and are important anchors for community identify and pride. Plunking heritage structures out of a community is like ripping apart the community's collective soul. It's a loss and it hurts everyone. I hope that never happens in my hometown of Carcar, Cebu. What is Carcar without our Dispensary, Rotunda and heritage houses. Hi Jerry! I agree with you one hundred percent! Jerry Acuzar’s is quite insane ! in his ambitious projects!!!! His projects seems to be nice but at an expense of other historical site. I remember that the ultimate lost of our hetitage lies on the collectors themselves since i saw a lot of historical documents just being bought and sold in auctions in many of clubs . an example is a 1995 UN Philippine error (Bengson was supposed to be featured) which was supposed to be kept in the Philpost Museum and Library but somehow someone managed to sneak out the error stamp in another local auction bourse held in Quezon City Sports Club ( E . Rodriguez) Luckily the head lead by Ms. Cuevas was able to halt the auction and the stamps were pulled-off . This incident happened just a few years ago. Expect more old houses to be carted away!!!!! Even with all those laws and bills filed in our Senate and House of Representatives without enforcement these laws will still be useless !!!! Yeah, I can site the replanting and reforestation efforts in the ravine and woodland area in Prospect Park here in Brooklyn. They are replanting it with saplings or trees that are natural or endemic in the area and not the 'exotic' ones that were introduced before. It was deemed that these non-native or exotic species have become invasive and often out-compete native trees, reproducing aggressively and causing a breakdown of the ecological interdependence between naturally occurring plant species and indigenous wildlife. They have studied the ecosystem there and decided to replant saplings, trees, shrubs and herbaceous plants, selecting species that are endemic in the land and reflects its natural diversity, in hopes that the ecosystem will become more self-sustaining. I agree w/Rence...the mayor is going the opposite direction of progressive metropolitan areas on the rest of the planet. Endemic species--especially those that occur naturally and can thrive in the geographic/environmental confines of Manila--are what that Arroceros Forest Park needed. We have so many indigenous trees that would do well w/out excessive pampering in the Manila ecosystem. I'm also wondering what happens when the next mayor has a different agenda and decides to cut back on the maintenance of all those trees. They seem kinda too close together...gonna cause big problems in the future as they grow. That's exactly what happened here in Honolulu when the present mayor spent big bucks ripping out acacias and Palawan cherrry trees planted along city streets by his predecessor just a few years ago. Having interviewed Mr. J Acuzar, I left his office feeling confused. This man is on a mission. He thinks he can catalyse a cultural renaissance in the Philippines. His daughter seemed quick to defend his controversial project, citing that this is her father's passion. This is how he is showing our youth that our country is beautiful. This girl seems just as convinced. They seem to actually believe in their cause. The truly tragic occurence is the fact that these homes made the front page. There are far more news-worthy events that need attention. Natural disasters anyone? Children anonymously and needlessly dying. The fact that most people in the Philippines probably couldnt even afford to access the internet everyday, let alone read. Why are we investing so much time bitching about artwork or a bad way of relocating artwork? Reality is, many architectural structures are torn down and used by scavengers, antique dealers, architects, et al for furniture, roofing etc. In some ways, Acuzar seems to be sending out a message we should listen to. These structures are a part of our country's dwindling identity. Had he not transferred said houses, I wonder whether any attention would have ever been drawn to these structures. Concomitantly, there is a point to be made in so far as that arguably structures that are a part of a community's heritage should not be torn down. It is not a matter of art. It is a matter of morality. The fact that Acuzar did not in fact relocate said Church says something. This man is not ruthlessly obsessed with this project. I wonder. Why do some art historians express hostility at what this man is doing. Do they not realise some of the homes he salvaged were due to be demolished and sold piece per piece anyway. Moreover, I suggest you look at the former surroundings of these homes. I am sure you will agree they are in a far more beautiful place now. The images look more beautiful than Amorsolo paintings. The best part is, you can actually touch them. They are not mere manifestations of the mind, but rather something concrete. Something tangible, real. I hope they last forever. No matter what anyone thinks. Obviously he didn't tell you he was using coffee table books as a shopping guide. Yes, he was able to save some houses. But the shopping part is what I'm not comfortable with. He's even after houses which are featured in the tourism brochure of Bulacan for example. You mention former surroundings? The Enriquez Mansion in Quiapo was part of a heritage street project before he ruthlessly uprooted it from there. He plans to build a 20-floor building on the said heritage street. Now what mission is that? That resoprt was owned by my clasmate's family. Ive beenn there once. Catch 22 situation for Acuzar. I am not for transport of heritage, because once removed, it (heritage) is already lost. However, in keeping it there, will it be saved? Hi Ivan! I've been following up on the Bagac project. I was wondering if you could update us a little? I've seen the place myself, and the pictures of a few of the houses before they were moved and renovated. And I have to say I'm quite torn: on the one hand, I believe that such icons of heritage should not be moved from their original sites, and yet on the other hand it feels like Acuzar has done a good job. I think it might be a little unfair to judge a whole project based on two newspaper articles; it's so much more than that. But then again, I'm not an expert. Would you have any updates? Thanks! We met face to face with Archt. Rico. Transfer of heritage is used as a very last resort, in situations where a house will be gone tomorrow if the transfer does not occur. that is the only situation where it can be justified. But in cases like the Enriquez Mansion where there was no threat since Acuzar himself owned the land it stood on, then it's obvious that transfer was inappropriate. The purchase and transfer of heritage properties that were not in danger in the first place is where this project must draw the line else earn the ire of advocates. Now, they build a multi-story building in a heritage street from which they ripped out a gem. Why did they have to transfer the Enriquez Mansion to Bagac? My trip last month to Las Casas in Bagac, Bataan was the first exposure I had to Mr. Acuzar's efforts at 'restoring' old houses. Without knowledge of the background story, I was obviously impressed by what I saw. Like many of your readers, I am torn between keeping the structures where they were originally built, versus preserving them now before they are gone, waiting for government agencies to do their work and for the locals to be educated on the true value of what they have. I completely agree with your thoughts on drawing the line at justifiable transfers (i.e., as a last resort). Are you aware of any movement on Mr. Acuzar's part towards this line? This would be an excellent starting point where private enterprise can work with government and the public towards preserving cultural heritage that after all belongs to everyone. We should all be able to go to old towns and see old houses where they were originally built, or go to heritage parks like Las Casas without feeling any guilt. Manila: Save Manila's old markets too!